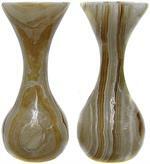 Item #BV-10: Matched pair of 4" tall, various styles in assorted natural colors Mexican Onyx Bud Vases. Item #MOV-3: Matched pair of 4" tall assorted natural colors Mexican Onyx Bud Vases. Item #BV-14: Matched pair of 5.5" tall, various styles in assorted natural colors Mexican Onyx bud vases.